The weekend after that, I flew to Hilo, on the island of Hawaii. 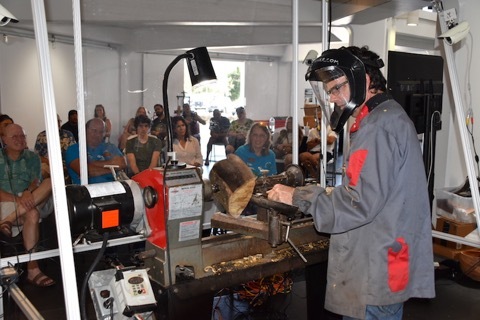 I was invited to do a demo at the 20th annual Hilo woodturners Wailoa Arts Center exhibition. One of Hawaii's most famous and talented artist picked me up at the airport, John Mydock. From there we went straight to the arts center. Wailoa is the only State owned arts center in Hawaii. It is located on a Tsunami flooding area, and right next to it it's the memorial to the 60 lives lost when the last big Tsunami hit Hawaii, May 23rd 1960. I did a Pheasant wood natural edge bowl, for a nice crowd of woodturners and non turners. I entered a pice, a Samoan coconut bowl, 23 inches wide. The piece got second in the popular vote!! After the exhibition, professional woodturner Aaron Hammer drove me around town, showing me some of the tourist attractions. I had the opportunity to spend a day with Aaron, we had lots of fun. I want to say thank you to Dennis Hakes, he's the club president, John Mydock and Aaron Hammer for the hospitality, they made me feel welcome and at home. I cant wait till next year!! Aloha from Maui. "Beach Dreams" 23 inch Samoan Coconut Platter. 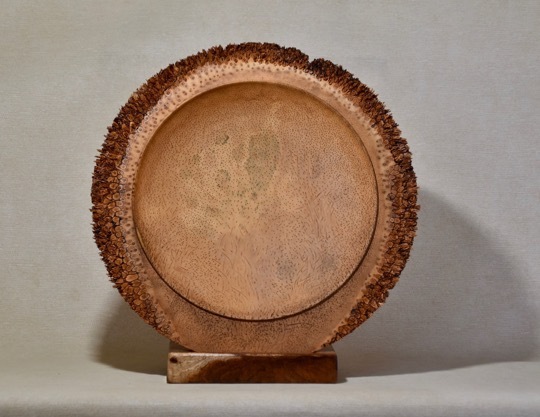 2nd place, popular vote at the 2018 Wailoa Arts center 20th annual Woodturning exhibition!